I know, I seem to be repeating myself here...but this is actually the end product of a very fun project launched by Heather. 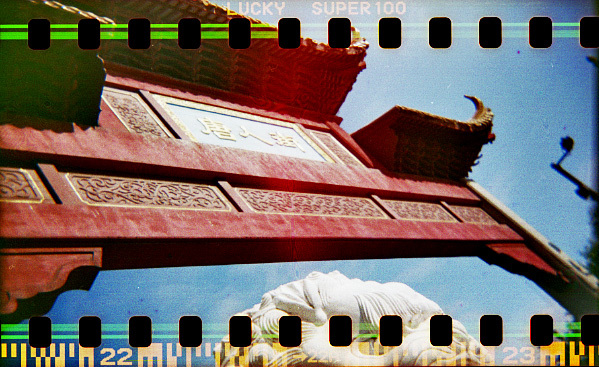 Modifying the Holga was a blast. Taking the shots was interesting (hmm..was that 34 clicks or did I misscount?). Getting it developed was funny (I had to explain twice what I was doing with the "black bag" before I handed the film over). 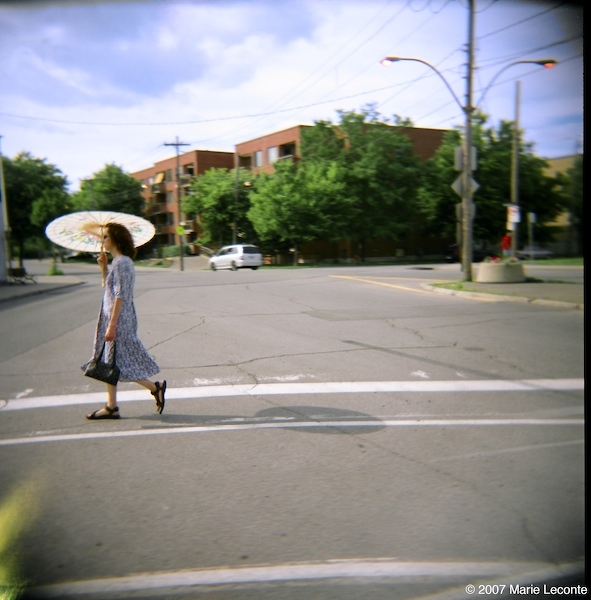 And finally, since no one could figure out how to scan a 35mm in a 120 scanner, I improvised with a piece of glass and my 150$ scanner...please forgive the crockedness of some of these! 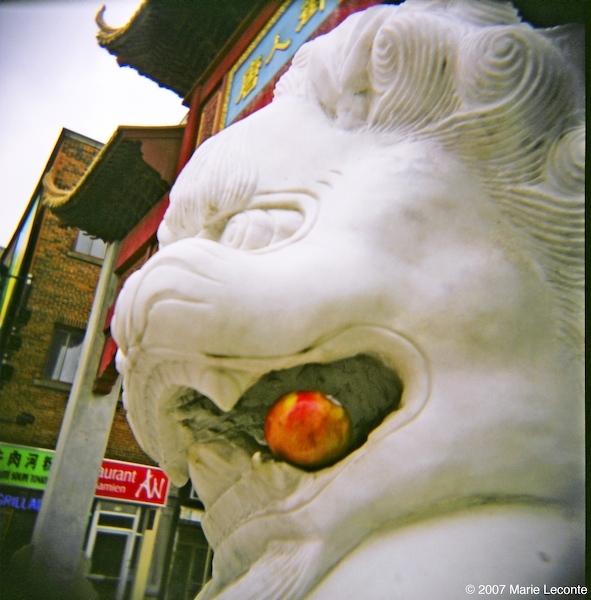 Apples are good, even for emperors! 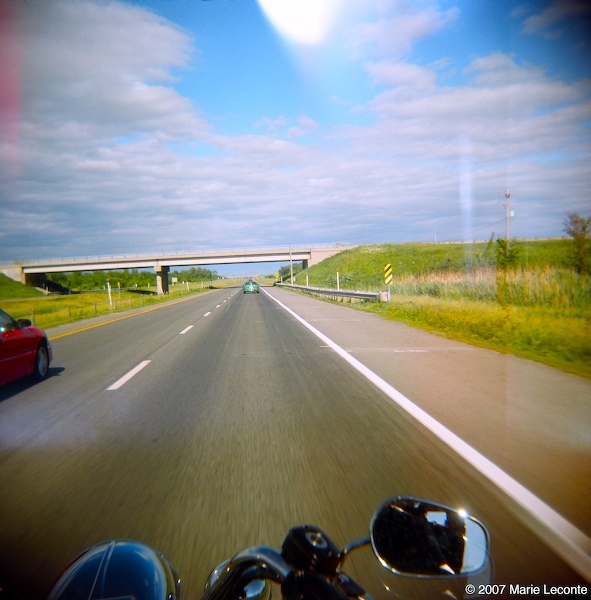 Holga on moto series. The last picture on the roll. 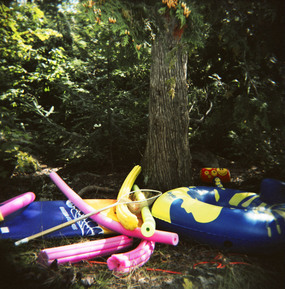 I whipped out the Holga last weekend and clicked away randomly...this shot was to remind me of all the good swims we had in the lake during this past season. We cleaned it all up and put it away, the lake being a tad too chilly to go into nowadays. Random focus in the shot is the typical Holganess that I adore. 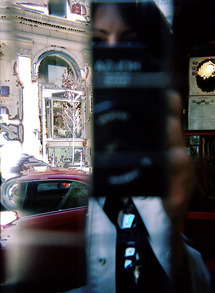 Strange mirror, taken on its corner made for a schizophrenic "supersampler" look of all behind me. Then I fiddled further in PS...hmmm. Still not sure. 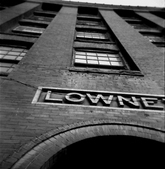 I love this building, the Lowney building. Always reminds me of the cherry blossoms I ate back when I was a kid. "They" (the all-knowing real estate dudes) are turning them into the all-cool "condo loft", whatever pray tell that might be. Taken with my holga and Ilford 100 delta 120 last fall and scanned on my Epson Perfection 1650 this evening. I am now able to scan my b/w negs and let you all see my daltonian-side. 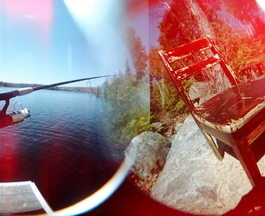 This is what happens with a fisheye lens mounted on a Holga along with a 6x6-sized frame and a forward-wind restriction that sticks all the frames together, hence a fishing rod headed for a chair. Oh...and the red glow is from the red colorflash. I kinda like the chair.